It’s a beautiful day to be outside. You gather up your favorite foods, your most comfortable blanket, and your closest friends for a day at the park. No sooner than you get set up, and the battle is on. You aren’t the only one in the park that’s hungry. Under your feet, a small-scale land battle is taking place for the right to claim your food. 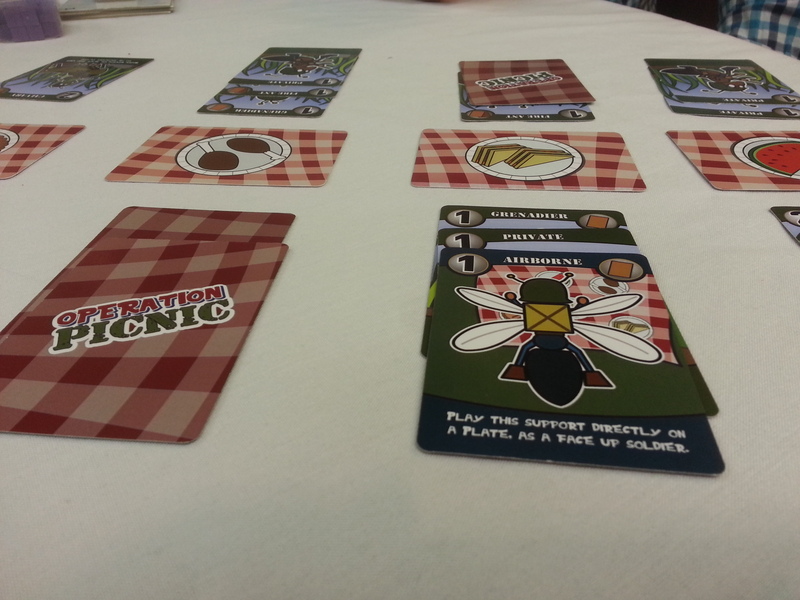 In Operation Picnic, the players take charge of their own army ants to wage a war for food. Laid out before you is a multitude of foods available for the taking. Overcome your opponents forces to drag Plates of Food home to your mound. Organize your army to capture 3 plates of food and you win the game! Operation Picnic is currently in Beta. I have tested and refined the game many times with trusted playtesters, and am now seeking outside testers for the game. The game is available as a print and play and on thegamecrafter.com for testing purposes. I intend to self publish this game in the near future, but would like to have as many tests as possible before I declare it finished. 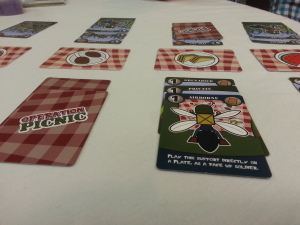 Operation Picnic started life as a Zombie game I designed for NaGaDeMon 2013. It is a new iteration of a game I designed nearly 15 years ago, so maybe that's cheating the rules a bit, but I finished it in one month and tested it. It worked, but the theme didn't. So, I changed it and love the new theme more.